The art of the charge: Where to find an emergency or opportunity charge. I always start my search in the same way. I find a place I would like to spend the time that it will take to charge and span out from there. Kayenta has a McDonalds. McDonalds has food and Wi-Fi. Perfect. Now to find an outlet. Outlets outside are uncommon, but I wouldn’t go anywhere close to calling them rare. In fact there are some places where you are almost guaranteed to find one. Hotels/ Motels (for some reason, there almost always seem to be an outlet or 4 somewhere on the outside of hotels. Every place I stayed on my trip to Pikes Peak had at least one receptacle and most had many more. Convenience stores- They have stuff outside and for this reason they are designed and built with receptacles on the outside. Sometimes owners will lock unused outlets, but usually they won’t, leaving you free to charge for a few minutes while you get something to drink and use the restroom. Grocery Stores I agree this is a weird one, and might just be specific to my area, but it seems that lots of grocery stores have outlets near the front door. You might get some weird looks plugging in there and I’ve never done it, but people tend to leave you alone if you aren’t bothering them. There are also a few places that are less of a sure bet, but will occasionally hide outlets you can use for a boost to your destination. Outside machines (Soda, Redbox, Water, etc.) There is usually only one plugged into a receptacle. You can use the other outlet. Signs I’m surprised by how many business signs have outlets under them or at the base. Landscaping Outlets: They aren’t common by any means, but large shopping centers and malls will sometimes have landscaping outlets scattered about the parking lot in islands and on light poles. These are convenient when you can find them because you can just park with other vehicles and don’t need an extension cord to reach the outlet. My last option and honestly one that I’ve never had to use with one notable exception is an outlet inside of a building. Most people will answer yes to a request that doesn’t require them to hand something over. You can literately just ask if you can run an extension cord inside the building to charge while you patronize. I know a few people who have done this. I lucked out in Kayenta. One building down from the McDonald's is an older gas station with an attached auto shop. In front of the auto shop are 3 two outlet receptacles. I plugged the bike in, walked over to McDonald’s, used the restroom, picked up some food to go, hopped on the Wi-Fi for a bit and walked back over to the bike. Then I used two of the outlets to run the quick charger for about 20 extra minutes while I ate. I was wary of using all 3 because two of them looked to be on the same circuit and I didn’t want to risk tripping the breaker so I charged with the bike on. I was on the road again and with a battery level of 40% I had a comfortable margin on which to make it to monument valley. Tomorrow we’ll be in Colorado and enjoying a cool mountain reprieve from the heat of summer. I always offer compensation, but I never ask first, that way if there is a policy of saying no, you don’t get stranded. I’ve never actually had anyone say no. I’ve also never had anyone accept my money, but I will continue the practice because I don’t want anyone to get the idea that EVers are thieves. 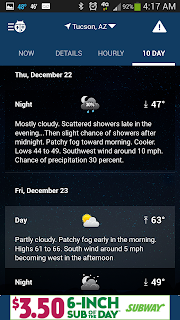 Is WeatherBug the best weather App ever? It just might Be. 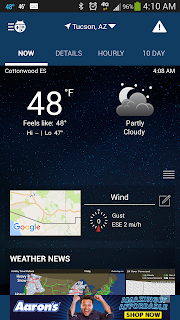 Somehow the WeatherBug app has evaded my notice despite always running two and frequently checking for improvements. I must say I'm impressed. 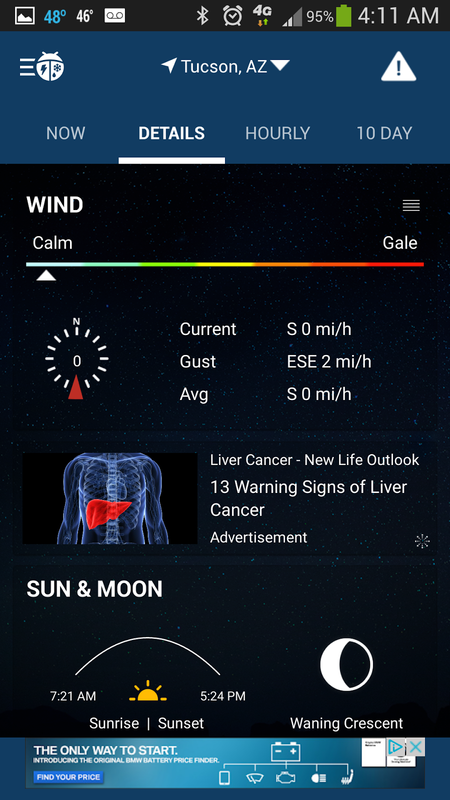 I knew this app would work perfectly for a daily riding motorcyclist the moment I opened it and was alerted to the fact that there was a wind advisory in my area. The ride to the restaurant where I had just downloaded the app could validate that advisory. The other apps on my phone did not have any such warning. The next day illuminated a difference as well. While the temperature between all three were about the same. 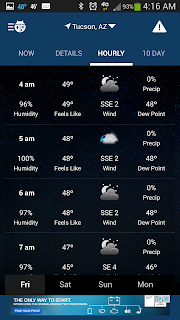 WeatherBug was the only one to predict that I would make it to the gym and then to work without getting wet. Cool, that saves time putting on rain gear. 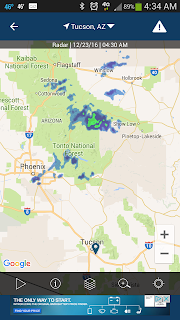 The others, maybe being cautious were showing rain straight through for the next 3 hours. I took my chances on WeatherBug and made it to work dry. On hindsight that was not a smart gamble. It's December; but I can say that I trust this app now. 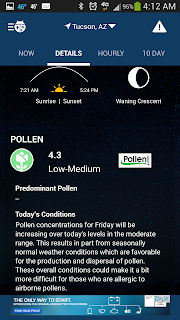 WeatherBug is also thorough. 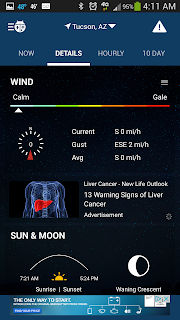 It's probably has the most complete information in any weather app. 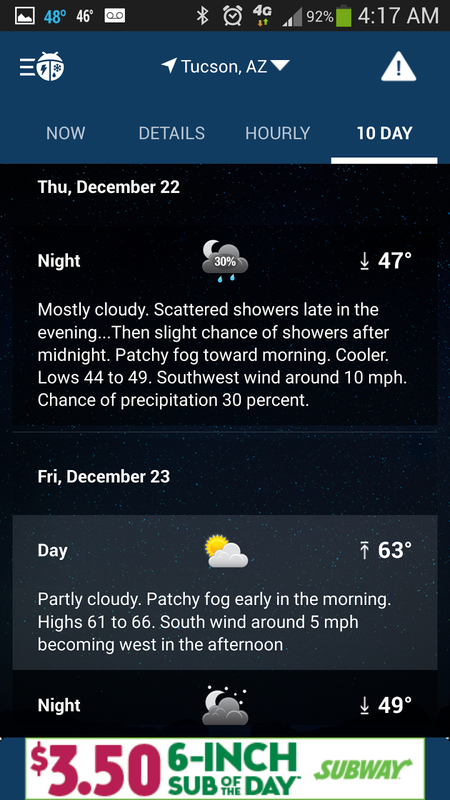 It's like having the local morning news forecast in your pocket. 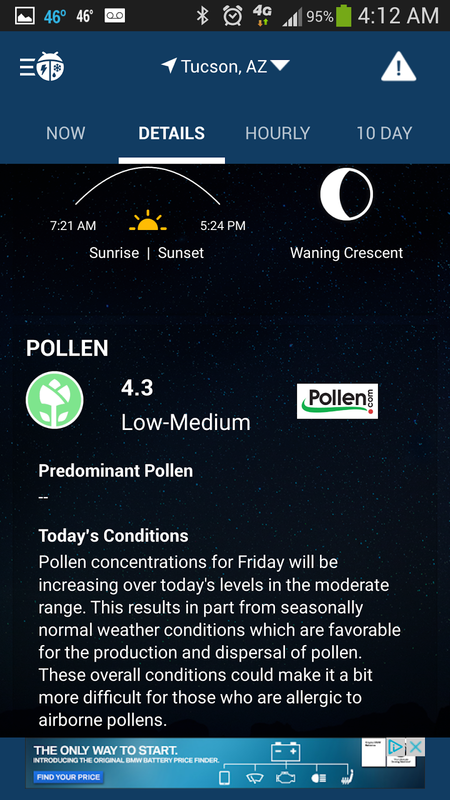 To this point, they even have short descriptions of what to expect for the day/ or night if you don't want to look at the hourly predictions, which they have as well and go out several days. 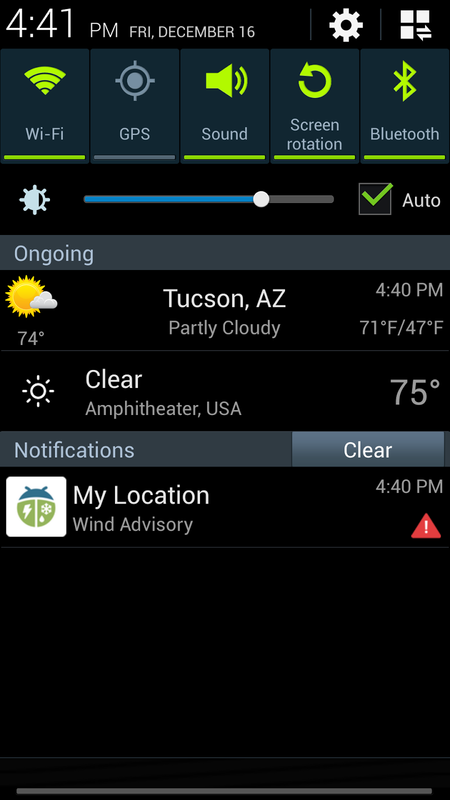 WeatherBug even has wind, weather radar and allergy reports, with live time views of both wind and radar. 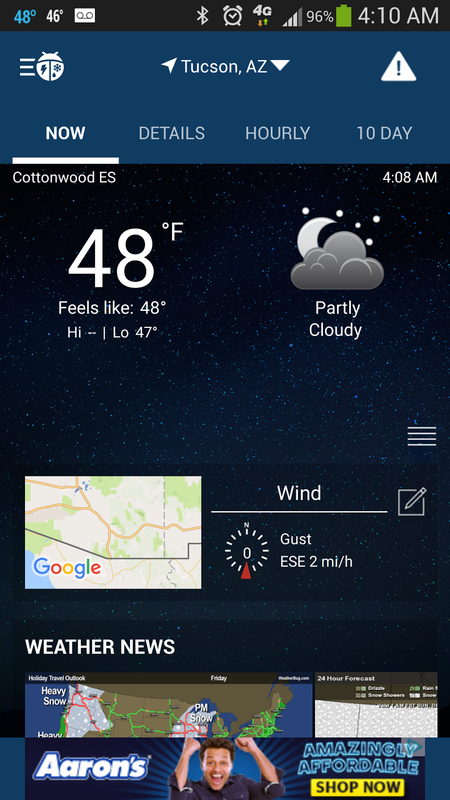 And of course Weatherbug has shows the current conditions on the status bar, notifications screen and on the weather app. It also has the one temperature that you actually care about, what it feels like. Arizona, where it feels like the actual temperature. As mentioned in a previous post, I tend to not watch the morning news forecast every day. 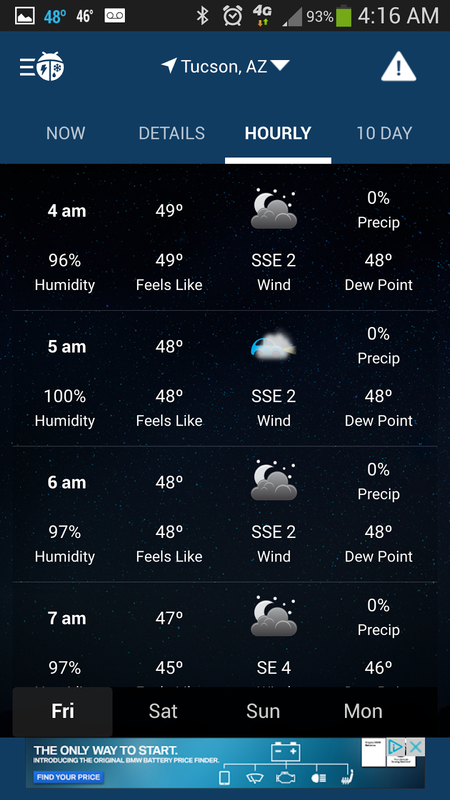 Now I don't need to, as long as I check my WeatherBug app before I throw the day's gear together. 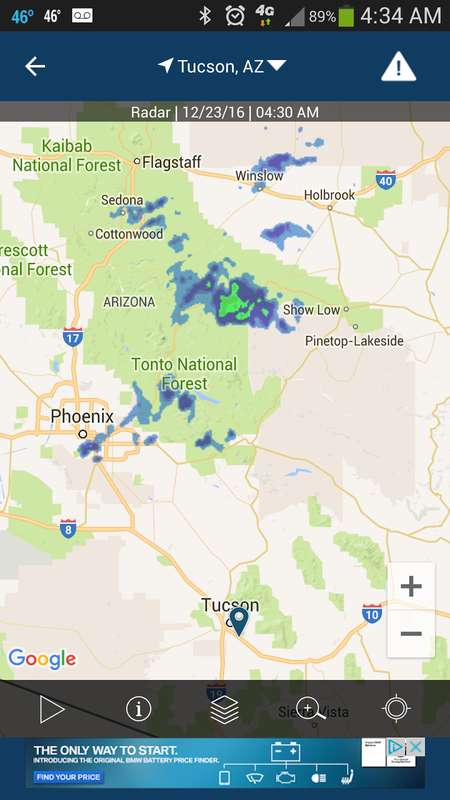 It literally shows me everything the weather man would, wind, allergies, radar, what to expect in the evening or tomorrow and even where the nearest lightning strike was and I don't have to listen to bad jokes and puns.